Our Email Marketing Software is a full-featured most powerful script in the usage of sending all in one solution for both Email and SMS. Day-to-day every communication became through SMS or mail so it will be the one for the complete solution to this. PHP Mass Mail Script is the ultimate return of profit in this business to start within the short period of time. Meet our multipurpose SMS and Email campaign or you can use it as both campaign to run a monetary business. Through an admin panel, configure SMTP configuration and SMS server configuration since you will never face double your trouble. It is quite easy to handle the clients through our ultimate marketing campaigns. PHP Email Marketing Script is suitable to send SMS mail for any kind of the industrial, personal or commercial purposes by providing various SMS gateway and service providers that will enhance your business in marketing. Digital world hooks up with only depends on the transmission of data by SMS or mail from one to another so there is a more demand for this script. Email Campaign Marketing Script can be used as a user by sending the request to the admin, start with the registration then can get the SMS or Email how much they are in need. Also, users can assign their SMS/Mail count to the users under them. The user can add the contact database to the file easily within the unique group and raise the ticket to the admin to know the status of a process. 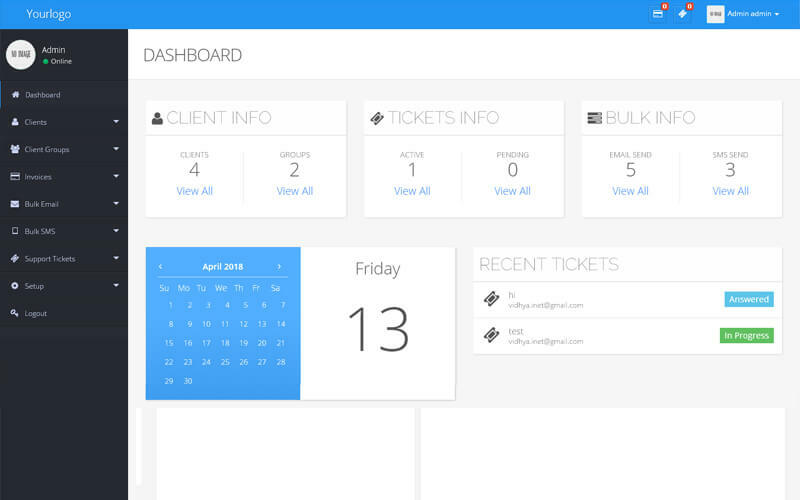 Users can also manage their count and control the users under them with separate admin panel efficiently. It shows the stats of emails or SMS sent, pending and left. Admin Panel has the rights to add and allocate the count to the users according to their membership plans. Admin can see the status of the ticket that it is in the process, delivered, pending or closed and produces the invoice to it. Admin will give the separate SMS gateway and service provider’s plans to each user. There are 4 different types of secure payment gateway is available for the users to pay. Admin can send the newsletters to the users. Bulk Email Sender PHP Script also can schedule the SMS to send automatically which has prepared to be in prior to the occasion of meeting or appointments. Bulk Email Marketing Software is very easy to access the two, admin and the user without any technical knowledge. To make the mail attractive, can design the email templates that send to the users. Our team enriched this script with lots of advanced features to access the services to reach the end-users more easily and effectively. Wonderful dynamic website by php scripts mall, hope my second project will done by here.